The work is one of the early experimental films by Apichatpong, produced while he attended the school of the Art Institute of Chicago. It is based on a long distance telephone conversation between the filmmaker and his mother in Khon Kaen. Apichatpong collaged his mother’s old photograph when she was young with the image from his apartment in Chicago. The appearance of his mother’s image not only recalls pieces of memories, but also conveys the artist’s strong yearnings for her. Hometown and foreign land, past and present, reality and memory, these are interlinked with each other through the superimposed images. Technically, four layers of B&W films were photographed frame-by-frame in an optical printing machine. 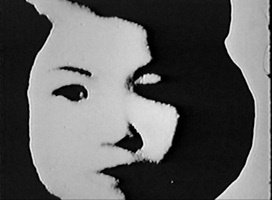 The exposure setting of each frame was calculated to reflect the intensity of the voices, which were previously mapped on the magnetic audio film strip. This ‘sculpting’ process reflects the influence of Apichatpong’s architectural background and his immersion into structural filmmaking.